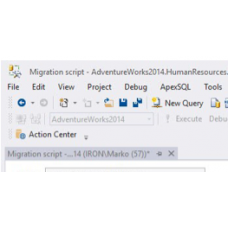 Integrate source control and SQL Server database development, simply and easily, with this add-in for SSMS. Including Git, Mercurial, SourceGear Vault, Subversion and Team Foundation Server. Object changes are displayed in a real time. Apply or roll back the latest changes directly to or from SQL source control. Perform source control operations on multiple objects simultaneously. Ability to work offline without losing data. Map some, most or all of your objects to source control using a powerful wizards. Including Beyond Compare, ExamDiff Pro and KDiff3. Have different databases on different models.